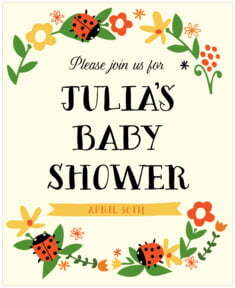 Lady Bug is an adorable design for a little one's special day - birthday, announcement, etc. Little flowers and leaves adorn the edges, and a little ladybug (or two) clambers on a leafy branch. This design is especially darling, with a vibrant and lively border brimming with flowers and ladybugs all around. A rustic banner flutters here and there with room for your words, and the main text is written in a rustic hand-lettered slab serif letter style that makes this design utterly irresistible! Customize your Lady Bug pet labels today! Lady Bug pet labels are made of your choice of coated paper or waterproof vinyl and can go on most any surface, including glass, paper, metal, wood, plastic, and more. The vinyl labels are waterproof so they will withstand time submerged in water or a damp setting such as a refrigerator. However, they do not hold up well to tooth marks, and if chewed on enough, they will eventually come off their container. 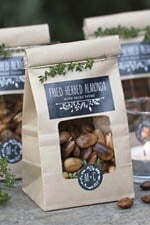 For more information about ideas you can use for your pet labels and recipes for pet gifts, please visit the Evermine Blog. To get started just select a desired shape and color, and then click on "Personalize" to begin customizing your Lady Bug pet labels today!